Looking to broaden their all-day offerings and double down on snacking, Subway has announced that they are bringing back their Savers menu this year. The range sees the return of their Hash Browns and Nachos whilst also adding the new subs. “The Subway Savers menu is available in stores now whilst stocks last. Three new Saver Subs have been added to the Savers menu: Nacho Chicken Salsa, Meat Feast or Cheese & Onion. Prices start from £2.59,” a spokesperson from the sandwich chain told QSR Media. The snacking range, first introduced last September 2018, will be promoted through a social media campaign that features a host of 8-bit emojis and nostalgic retro gaming cues that is said to give their customers a ‘winning feeling’. “Our Subway Savers menu was initially introduced in 2018 and was extremely popular with our guests, so we’re excited for its return. We pride ourselves in offering guests more choice at all times of the day, so it’s great to have added the three epic Saver Subs to the Saver menu available throughout the day,” Colin Hughes, country director for Subway UK & Ireland, said. 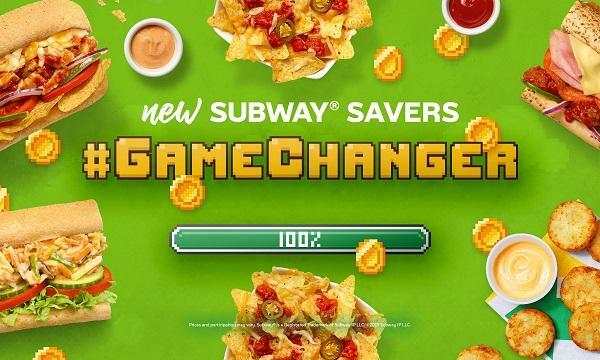 In addition, the sandwich chain will be giving away 200 subcard points when purchasing any offering from the Savers menu and scan their Subcard App in-store. The promo will run for the whole month of January.